The gift of education is always welcome whether for special occasions, holidays, or just to recognize the achievements of a special young person. Are you a Maine resident? If either the account owner or the account beneficiary is a Maine resident, contributions, including gifts, may be matched with Maine’s annual NextStep Matching Grant1. Contributions will be matched by 50% every year, up to a $300 match. Consider enlisting grandparents, other family members and friends to give the gift of education and help you meet your family’s college savings goals. Download and print a contribution coupon. 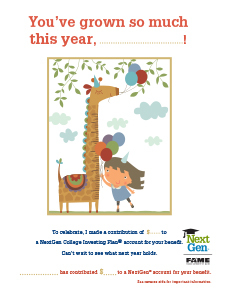 Fill out contribution coupon — make sure to include the NextGen 529 account number. If you don’t have your account number handy, find it on your most recent NextGen 529 account statement or call Merrill Lynch at 1-877-463-9843. 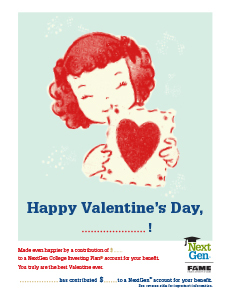 Did you know gift contributions can be made through Gift of College? 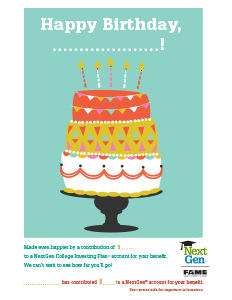 Gift of College* offers options for family and friends to make contributions to college savings accounts. 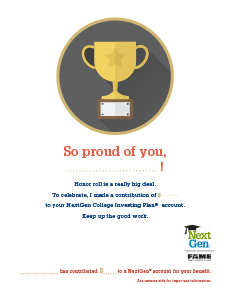 A NextGen 529 account owner can create an online gift registry at GiftofCollege.com and link it to his or her account. 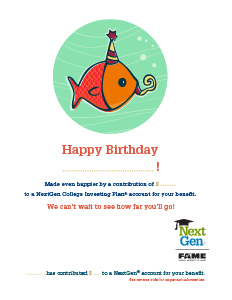 Relatives and friends can then use Gift of College to make gift contributions to the NextGen 529 account online or to purchase a Gift of College gift card. Visit GiftofCollege.com to learn more! 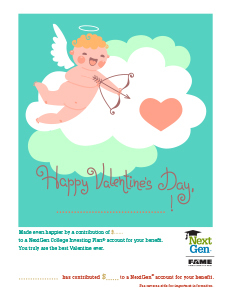 Once you’ve made a contribution, download & print one of the cards pictured below. Simply add your name and the child’s name, roll it up and tie it with a bow. 1Grants are linked to eligible Maine accounts. Upon withdrawal, grants are paid only to institutions of higher education. See Terms and Conditions of Maine Grant Programs for other conditions and restrictions that apply. 2Third Party Contributions: Persons other than the account owner who make contributions will have no subsequent control over the funds contributed to a NextGen 529 account. Only the NextGen 529 account owner will receive confirmation of account transactions and may direct transfers, rollovers, investment changes, withdrawals and change the account beneficiary (as permitted under federal law). Third party contributors may subject NextGen 529 account owners to tax consequences. NextGen 529 account owners and third party contributors should consult their tax advisors to discuss income or gift tax consequences. 3 If you make the five-year election to prorate a lump-sum contribution that exceeds the annual federal gift tax exclusion amount and you die before the end of the five-year period, the amounts allocated to the years after your death will be included in your gross estate for tax purposes. Please consult your tax and/or legal advisor for specific guidance before making investment decisions that could affect your taxes or estate or Medicaid planning needs.